Yiweir Return Policy: We could accept the return in 30 days after you receive the package. We would refund you the total price of the item except shipping fees. But please kindly note that it would not affect the resale of the product, for example, it contains no perfume flavor and is packaged as the original package you received. Sweet, elegant design, make you more charming. One perfect fit for most women lady girls at any occasion. For standard shipping service, it needs about 1-2 weeks. For expedited shipping service is about 3-5 business days. Occassion: This beautiful, timeless, classy and elegant vintage inspired feather fascinator hat is suitable for as a wedding fascinator, tea party hat, cocktail hat, garden party, costume party, bridal party, easter, church, fashion show, carnivals, performance, black merry widow hat or any special occasion. Size & Material: One size fits all.Beautiful lightweight handmade.The headpiece is made of veil, bowknot and feather, which make the fascinator looks substantial and vibrant. Fascinators hats for women come with a head band and a hair clip! 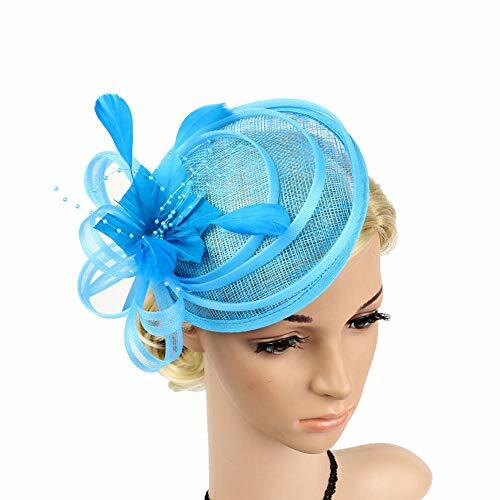 Perfect Gifts: The fascinator will be a great gift for your daughter, mother, grandmother, friends, sisters, colleague and yourself on Valentine's Day, Halloween Costume, Christmas and Vintage Party, for your mom on Mother's Day. Brand New Design:The fascinators is reversible and removable on the headband, you can free combination of them, and it is easy to wear with a comfortable headband or the hair clip to secure to the hair. Classic design exterior with flower feather decoration hair clip for derby. Bridal fascinator clip for unique wedding and party accessories. If you have any questions about this product by Yiweir, contact us by completing and submitting the form below. If you are looking for a specif part number, please include it with your message.